An island of countless tropical delights. Lizard Island is Australia’s northernmost island resort. It is located 150 miles north of Cairns and 57 miles north east off the coast from Cooktown. Lizard Island is an absolute tropical paradise, a haven of isolation, gratification and relaxation. In 1770 Captain James Cook first ventured into these uncharted reaches as the last chance for a crew seeking freedom from the beautiful but deadly coral reefs of the Great Barrier Reef. Cook anchored in one of the island’s bays and climbed to the top of the hill now known as Cook’s Look. There he surveyed a suitable passage away from the island. On Lizard Island, goannas can be found almost everywhere, and were so common when James Cook first landed that it didn’t take him long to name the island after them. Today, Lizard Island offers the best of the Great Barrier Reef, both the inner and outer Reef experiences. Here you can snorkel off a secluded beach, there are 24 powdery white beaches just waiting to be explored, and swim in the famous Blue Lagoon. Venture a little further a field, set your sights on the sheer magnificence of Australia’s Great Barrier Reef. Lizard Island is a National Park covering over 1000 hectares, the highest peak being Cooks Look at 359 meters, and the prolific bird life will amaze. It has its own airstrip and Royal Flying Doctor medical facilities, with 24 hour radio contact with the Flying Doctor base in Cairns. Those in search of real escape continue to voyage from all corners of the earth to experience this rare and remarkable reef adventure. They come to experience the complete freedom, the breathtaking views and countless tropical delights this exotic destination affords the discerning traveler. Shrouded with tropical palms and deserted sandy shores, the ultra-exclusive Lizard Island Resort is situated right on the world famous Great Barrier Reef. Accommodation consist of private rooms with a balcony overlooking magnificent sandy beaches and native gardens. Activities include, but are not limited to tennis, windsurfing, water-skiing, catamaran sailing, glass bottom boat trips, paddle skis, outboard dinghies, fishing gear, snorkeling gear, bushwalking, hiking and picnics. The diving is the best in the world, and there are no day-trippers to clatter past, just attentive service, heaped plates of tropical fruit and freshly cooked seafood, the soft breeze on your veranda, absolute quiet, champagne, and each other. 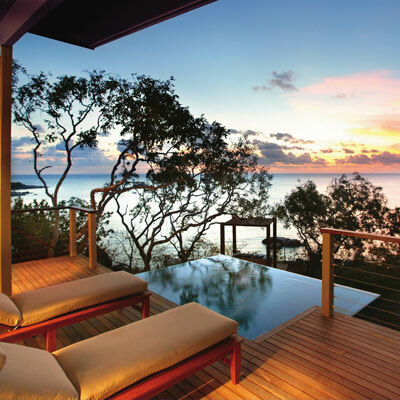 Basically, Lizard Island Resort is paradise! Lizard Island is renowned for its diving. At the world famous ‘Cod Hole’, one of the many unforgettable dive sites that are close by and a favourite spot that fascinates divers, you’ll get to experience the countless and dazzling array of tropical fish, and come face to face with a massive yet curious Potato Cod swimming right up to inspect you with child-like curiosity. For a more up close experience of this lively underwater world, Lizard Island Resort can arrange diving trips out to the heart of the barrier reef. There are also night dives and diving tuition available for guests. The following video shows the Cod Hole, just near Lizard Island. Put on your flippers and walk off the beach and into the most impressive sea life. Discover a garden of giant clams and the colorful marine life of Lizard Island’s spectacular fringing coral reefs. Lizard Island has everything, right at its front door. Poolside at Lizard Island Resort. Come face to face with giant potato cod at Lizard Island. Experience the finest accomodation at Lizard Island Resort. Camping is allowed on Lizard Island as long as a permit has been issued (phone the National Parks and Wildlife Service in Cairns on (07) 4052 3096. 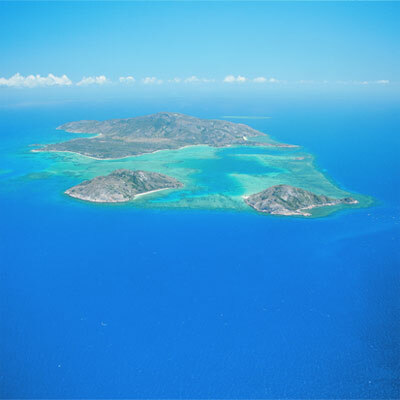 The Lizard Island research station conducts tours every Monday and Friday, tel: (07) 4060 3977.